Electron shell diagram for radium. 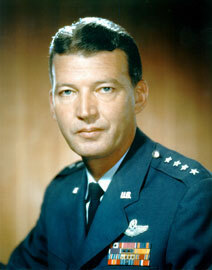 Bernard Schriever was an aerospace engineer and administrator who figured prominently in American missile development. Schriever earned a B.S. in architectural engineering from Texas A&M in 1931 and was commissioned in the Army Air Corps Reserve in 1933 after completing pilot training. He earned an M.A. in aeronautical engineering from Stanford in 1942 and then flew 63 combat missions in the Pacific Theater during World War II. In 1954, he became commander of the Western Development Division (soon renamed the Air Force Ballistic Missile Division), and from 1959 to 1966 was commander of its parent organization, the Air Research and Development Command (renamed Air Force Systems Command in 1961). As such, he oversaw the development of the Atlas, Thor, and Titan missiles, introducing a systems approach, whereby the various components of the Atlas and succeeding missiles underwent simultaneous design and testing. Schriever also instigated the practice of concurrency, which allowed the components of missiles to enter production while still in the test phase, thereby speeding up development. He retired as a general in 1966.